Nine Patch Delight 40" x 48"
Joannes Designs Week2 Nine Patch Delight was a design I created for a baby quilt. We had a fabric swap at our quilting group and this is the quilt I made from my fabrics. We all brought a fat quarter in spring tones to the group meeting and these were then all cut up into 5" squares and redistributed amongst us. With mine I managed to use them as a base for the nine patch blocks. The quilt then sat in the cupboard for quite a while while I decided what to add to it to make it into a quilt top for a baby. As you can see at the bottom of the page I added some appliqué teddies onto a wide border. I have yet to master the art of tracing over my drawings in EQ7 so I'm afraid I haven't added those templates to the pattern. I have tried several times but the results are just not good enough to pass on - sorry. Hence the 52 week challenge. I will add appliqué templates in time as I'm able. 1. Trace around the appliqué template onto steam-a-seam. You will do this 18 times. Rough cut each out - not on the lines but about a 1/4" or so away. 2. 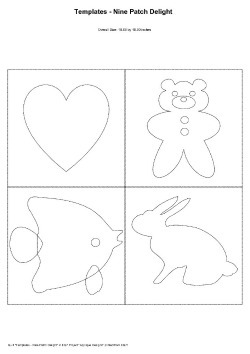 Peel off & discard the paper backing that doesn't have the pattern drawn on it. Then place the template on the wrong side of fabric. Press. 4. Peel off the second paper and discard. Position the appliqué right side facing spacing it evenly along the borders. Press. 5. Machine stitch around the appliqué using your preferred stitch. I use a blind stitch in matching thread. 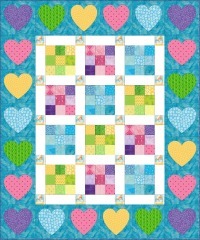 To make this quilt you will need a selection of 2 1/2" x 2 1/2" squares in whatever colour-ways you choose. The quilt is made from 12 blocks each measuring 6 1/2" x 6 1/2" (6" x 6" finished). The sashing needs to be the same width as the cornerstones. Mine are the same as the blocks - all 2 1/2" wide. 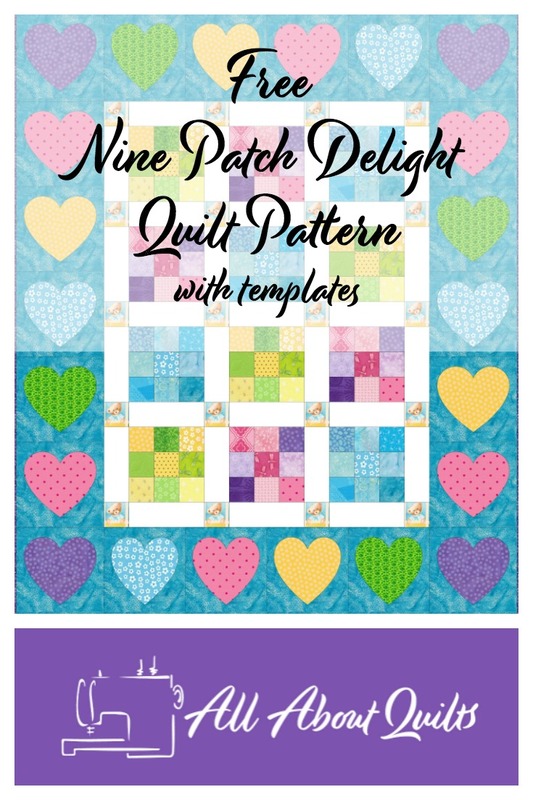 Click on the image below to download the PDF pattern for Nine Patch Delight - Joannes Designs Week2. 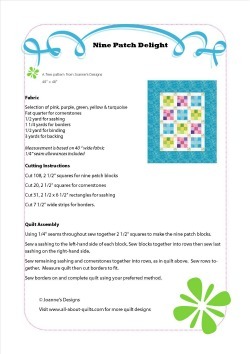 These are the 2 items that I used when I made my quilt from this pattern (shown at the bottom of the page). I highly recommend both when doing appliqué. My appliqué pressing sheet is now on its 12th year and still works just like when it was new. I still use the bag it came in and shown below, to store it in! 1. Make all the nine patch blocks up first. This can be done quite quickly by chain piecing. 2. Remember to iron each rows seam allowances in opposite directions so that your seams line up well. 3. Next add your sashing to the blocks one row at a time. 4. Have fun with the cornerstones. In the quilt I added a wee heart. In the pattern I placed a teddy-bear. Have fun! 5. Remember to measure your quilt top in 2 places to get an average measurement before cutting your borders. 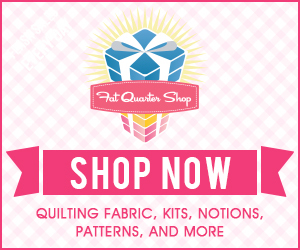 Because this quilt is made from quite a few small squares there can be a tendency for the quilt edges to stretch. My advice is to always cut your borders to match the actual quilt, rather than follow the pattern measurements. 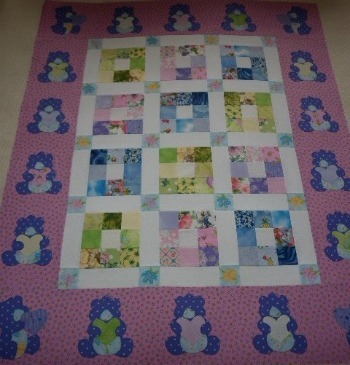 Below is a photo of my quilt top using Joannes Designs Week2 pattern. I hope you enjoyed Joannes Designs Week2. 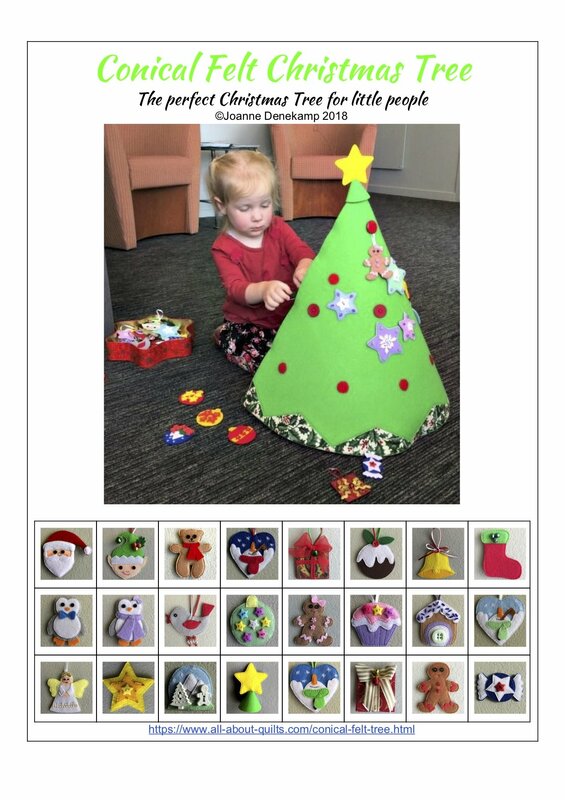 Just 50 patterns to go!